Most people know that they can increase the value of their home by updating their kitchens or bathrooms or adding curb appeal to the outside of the home. However, there is one area of the home that most homeowners overlook that can add or detract from the value of your home and may even be the deciding factor as to whether a potential buyer purchases your home or moves on. That area is your closets. Having adequate storage space is important to home buyers and if your closets are cluttered and unorganized then potential buyers will see your home as lacking in an essential necessity for their comfort. However, with a little effort on your part you can transform your closets at little expense to be extremely appealing to a potential buyer and more useful to your family as well. The first thing you want to do is get rid of all that old stuff you have been hanging on to for years. Do you really think you are going to be wearing that ten year old brides maids dress from your friends wedding again or read that stack of magazines that has just been sitting on the shelf gathering dust? By getting rid of those old things you really are never going to use again you can make your closet more organized and look larger. 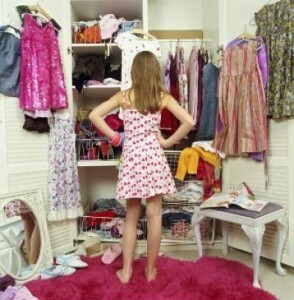 Once you have all the clutter out of the way you can look at your closet with a more objective eye. Is that long shelf that runs the entire length of your closet an unsightly jumble? Could you organize it better by dividing it into sections or even adding another shelf over the one that is there? Dividing the shelf into cubbies could be just the thing to help you get organized and make your closet look more spacious and less cluttered. Now turn your attention to that clothing rod and your clothes themselves. Do you have more shirts, pants and skirts than you do long dresses? If so putting a double rod in part of the closet can make a lot of extra space and make your closet look larger. It might even give you enough space to add a couple of drawers for those clothes that should be folded instead of hung up. Or perhaps you could put a set of cubbies under the hanging clothes to get those shoes off the floor and make storage space for all those purses. 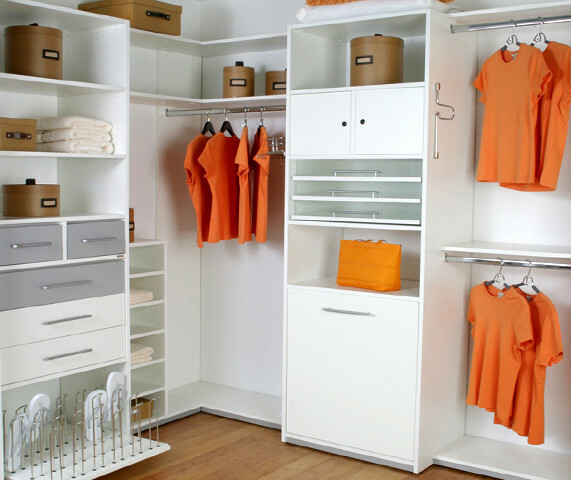 Once you have organized those bedroom closets then turn your attention to that kitchen pantry and linen closet. Little totes or bins can help keep those small items in your bathroom linen closet neat and out of the way. Adding stack-able baskets to your kitchen pantry can not only save space but make items easier to reach. Adding a storage closet or some shelves to one end of the garage could get rid of the clutter and create useable space for wood working or other home projects or even to actually park the car inside. There are a number of companies that make inexpensive storage solutions from complete closet organizers to bins and storage boxes, to tie and belt racks. Pick and choose from among the ones you need or make it a complete do it yourself project. The solutions are available you just need to use them. Organizing your closets can make those spaces look larger and more appealing and just may add value to your home and wow those potential buyers.